The COMMITTEE for the Prevention of CONTAGIOUS FEVER are sorry to find that the Fever is still on the INCREASE; but having, through the kind interference of the Lord Lieutenant of the County, procured the use of the Barrack Hospital, in addition to the House of Recovery already fitted up, they trust, soon, to be able to give a more favourable Report. The expence attending the support of so many indigent people IS SO GREAT, that the Inhabitants, who have not already subscribed, must, unavoidably, soon be waited upon. In the meantime, the Committee earnestly solicit such BENEVOLENT FAMILIES as can spare Old Clothes, Blankets or Carpets, that they will send in the same, with as little delay as possible, to the House of Recovery, Gallowgate-head. Tuesday Evening, 15th Dec. 1818. Published in the Aberdeen Journal, Wednesday 16th December 1818. Although the Armistice was signed on 11th November 1918, the conflict continued to claim lives. 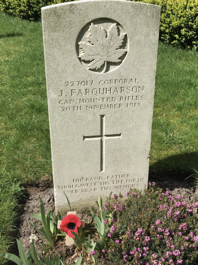 Today we remember John Farquharson, Cpl 227017, Canadian Mounted Rifles, who died of wounds on 20th November 1918, aged 41 years. Born 3rd October 1877 at South High Street, Portsoy, John married Isabella Chalmers (also of Portsoy) in St Pancras, London in 1909. They went on to make their home in Hamilton,Ontario,Canada. John enlisted, aged 38, and served with the Canadian Mounted Rifles. He sailed from Halifax, N.S. on the RMS Olympic in July 1916, sister ship of the Titanic. 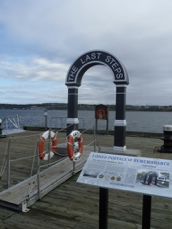 Those service personnel taking their ”Last Steps” on Canadian soil are remembered today on similar memorials on the quay at Halifax, N.S. and at Passchendaele in Flanders. John died of influenza on the 20.11.1918 at the Military Hospital in Farnham and was buried at Bordon Military Cemetery in Hampshire. John is remembered on Portsoy War Memorial and also on the family grave stone in Portsoy. Thanks to Susan Strang for supplying family details. On 20th October, the anniversary of his death, we remember Alexander Sandison, Trooper, South African Light Horse. Alexander was 38 years of age when he lost his life in combat. He was the son of Jane Sandison, who lived in Low Street, Portsoy. 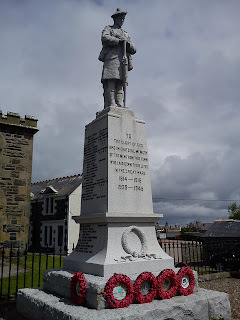 Alexander is commemorated on the Portsoy Town memorial. On this day we think of Lance-Corporal John Innes, 17th Bn. Royal Scots, who died of wounds received in battle on 29th September 1918, aged 42. John was born in Portsoy to Joseph and Jane Innes and left behind a widow Elsie, whose address was 75 Dalry Road, Edinburgh. A gravestone is dedicated to John at Zantvoorde British cemetery near Ypres in Belgium. Today Portsoy remembers William McBain, Pte 64118, 27th Royal Army Medical Corps Field Ambulance, who was killed in action on 28th September 1918, at the age of 35. A native of Portsoy, he was the son of John & Agnes McBain who subsequently lived in Coaltown of Wemyss, Fife. A gravestone is dedicated to William at Perth Cemetery (China Wall) near Ypres in Belgium. Today, 27th August, marks the centenary of the death of 2nd Lieut. John Grant Watt. He was killed in action while serving with 7th Bn. Gordon Highlanders and was 24 years of age when he lost his life in combat. His parents, Charles and Jessie Watt, lived at Durn Road in Portsoy. Together with over 9,000 men, he is commemorated on the Vis-en-Artois memorial, Pas de Calais, France. Today marks the anniversary of the death in battle of Robert Topp, Pte 528051, London Scottish Regiment. He had previously served as Pte 10956, 1st Battalion Gordon Highlanders. He was just 20 years of age when he was killed in action on the western front. Robert's parents, Alexander and Jane Topp, lived at 8, South High Street in Portsoy. Together with almost 10,000 war casualties, Robert is commemorated at Vis-en-Artois cemetery in Pas-de-Calais, France.